If we are to pursue and achieve the aspirations outlined in Achieving Excellence on the World Stage, Western will need incremental resources to support these ambitions. This also means making more effective and selective use of our available resources to maintain the fiscal capacity and flexibility that will allow Western to engage proactively with future opportunities that may emerge in alignment with our strategic priorities. As a publicly assisted university, Western depends significantly on grants from the Provincial government to fund its operations, and from the Federal government for research support. Currently, 45% of our operating funds come from government grants, while the balance comes from domestic student tuition (35%), international student tuition (7%), and other sources, including private philanthropy and corporate partnerships (13%). However, Western operates in a fiscal environment in which there is a growing gap between public expectations and the government's ability to fund important public services and investments. The rising cost of health care, coupled with an aging population and an ever-increasing debt burden for the provincial government has led to the decline of funding allocations for postsecondary education on a per student basis. As a result, the Provincial share of our operating budget has declined from 85% in the late 1970s, to 45% in 2012. Private philanthropy: Western is fortunate to enjoy the philanthropic support of thousands of generous alumni, corporations, foundations and other friends of the University. In fact, fundraising initiatives dating back to the "Second Century Campaign" (1979-1985) have generated more than $1 billion in additional revenue for Western and hundreds of millions more through various government donor-matching programs. Having surpassed the half-way point in our current $750-million "Be Extraordinary" Campaign, Western will continue to engage private partners seeking to invest in University priorities, including student aid, scholarships and endowed research chairs. Enhanced alumni giving: Western's more than 260,000 alumni, who are spread around the world, count among our University's most important stewards. Over the years, their financial support has helped Western build excellence in select areas of teaching and research activity that would not have been possible relying only on traditional sources of revenues. Western's ability to achieve its ambitious goals will, importantly, depend on our ability to significantly increase alumni giving. In our distant past, Western could rely largely on public funding to achieve its goals, and as a direct consequence many of our alumni have not felt the need to support Western directly. They correctly understood that taxes provided adequate funding for great public institutions like Western. This is no longer the case. Western's current provincial operating grant covers 45% of the University's operating expenditures. We need to make the case to our alumni that their giving can make a difference between excellence and mediocrity. To this end, Western is committed to working with our alumni to promote a culture of alumni giving to support excellence. Private sector partnerships: Collaborative initiatives that engage private sector partners in order to tackle pressing real-world challenges represent an important means of fulfilling Western's mission to create, disseminate and apply knowledge for the benefit of society. Western is committed to identifying and pursuing partnership opportunities that are clearly aligned with Western's institutional strengths, strategic, and academic priorities, while taking care to maintain the highest standards of academic integrity in all our partnership endeavours. Enhanced investment returns: Since 1988, Western has invested revenues received but not yet expended as a means of generating additional resources for strategic priorities. Through a prudent mix of short-term non-endowed and long-term endowed investments, this strategy has generated more than $103 million in additional funding for University priorities over the past decade. Moreover, since this practice was adopted, Western's financial planning has achieved annualized returns of 5.9%. Western will continue to monitor and refine its investment strategies with a view to minimizing risk and maximizing returns. Investing resources to support excellence and strategic initiatives: Despite a decline in per-student funding support from government sources, the provincial grant remains the major source of our revenue. The other significant source of our revenue comes from student fees regulated by the Province. Consequently, over 80% of our revenue depends on government funding and/or policies. Over the decades, Western has experienced significant shifts in funding policy that have affected our revenue sources. Our dependence on the health of Ontario's public finances links the University's financial outlook to the often unpredictable fluctuations of budgetary cycles. Continued prudent management of our resources is therefore a must if Western is to pursue its strategic priorities. 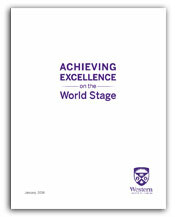 To this end, Western will manage its resources to ensure that the long-term interests of the institution are protected. Our financial strategies in this endeavour include avoiding structural deficits, and building budgetary flexibility at all levels so that we can deal with unanticipated fiscal challenges, and uncertain funding regimes, without resorting to actions detrimental to the well-being of the institution.